Understanding the laws regarding fraudulent transfers is essential to sound asset protection planning. Although the law favors and encourages asset protection in most circumstances, there comes a point in financial transactions and legal proceedings when it is no longer permitted. In some cases this boundary is clearly defined, but often the question of when the remedy of asset protection is still permissible is fuzzy. Protecting personal assets from risk of loss and liability is firmly established as an accepted part of sound financial and business planning. The use of trusts, corporations, limited liability companies, family limited partnerships, and other strategies encourage business development and investment by enabling individuals and businesses to effectively limit potential losses from their professional activities. Clearly, business activity would diminish and the range of professional services offered would be substantially curtailed if individuals were unable to protect personal assets from lawsuits and liability exposure. 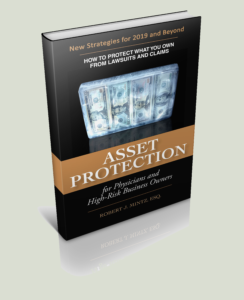 The key consideration in asset protection has to do with when and why plans are enacted. Laws in every state prohibit the transfer of property intended to “hinder, delay, or defraud” a creditor in order to avoid paying an imminent legal obligation (a practice known as a “fraudulent transfer”). The law also prohibits transfers that leave you unable to meet your foreseeable obligations. How does asset protection function within the framework of the fraudulent transfer rules? In some cases the answer is clear: you cannot protect property from an already-incurred debt or judgment. You are obligated to maintain the ability to satisfy existing debts from your available assets or income. It is permissible to create an asset protection plan while you have outstanding obligations, as long as it is not directed at your current debts and you make available sufficient resources, from income or other assets, to repay your outstanding debt on a timely basis. If you fail to repay an existing debt, and it can be proven that the asset protection plan was intended to avoid this payment, fraudulent transfer rules permit your creditors to set aside the plan to reach those assets purposely moved out of harm’s way. Although the law prevents you from creating an asset protection plan to evade current debts, it does allow for asset protection planning to avoid liability from future, unanticipated creditors. In these cases we can reasonably distinguish between “existing claims” and those that are still “potential, future, unforeseen claims.” Let’s say that you are a physician and you set up an asset protection plan. A negligent act involving a patient occurs several months later. Fraudulent transfer is not an issue in this case because the property transfer was unrelated to the claim subsequently developed by this patient. Presumably, at the time you implemented your asset protection plan, you did not know or intend that the patient would be injured. Similarly, loans and contracts entered into after establishing a plan, as long as the creditor is not misled, are also outside the scope of the fraudulent transfer rules. Some cases, however, are not so cut and dried. Again, using a physician example, lawsuits are often triggered by a negative but unavoidable outcome for a patient, without any wrongdoing or negligence by anyone. How do fraudulent transfer rules apply to a physician involved in a high-risk case, with clear potential for an unfavorable result? The focus in these cases should be the point at which the patient develops a claim when he or she can establish both negligence and damages. In legal terms, that is when the cause of action arises. If neither of these elements has occurred then the physician is safely in the protected zone. But when one or both happen it is at least arguable that the line has been crossed and asset protection might not be effective if a successful case is later filed by that patient.